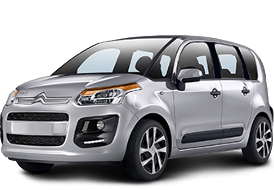 The French minivan with a 1.6-liter diesel engine and automatic transmission can be found in any European city for the simple reason that it meets all the basic requirements: ease of operation, comfortable and spacious interior, high functionality. The car accelerates to 185 km / h, while spending 9 liters per 100 km in the city, 4.9 liters on the highway and only 6.4 liters in a mixed cycle. Number of seats - 5. Mediteranska bb, 85310 Budva, Montenegro.